Our garage floor paint is available in a range of 7 gloss colours making it easy to add a great decorative finish to your garage. Our garage floor paint is available in a range of 7 gloss colours making it easy to add a great decorative finish to your garage. It’s a 2 part polyurethane based paint system that cures much harder than epoxy based alternatives. 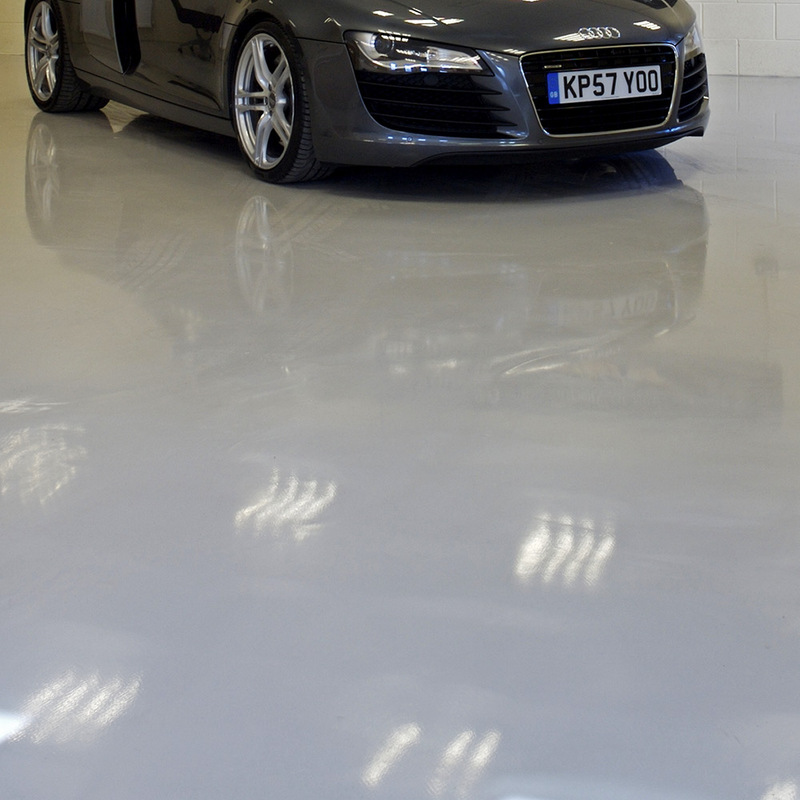 The resulting hard wearing surface is hygienic and scratch resistant from the tools, tyres and items generally subjected to garage flooring in a family home. As well as garage spaces it’s also perfect for use in workshops and utility rooms and any space where a smooth dust free finish is required. Each 5kg unit will cover up to 20m² depending on the porosity of the current surface, two 5kg packs would be enough to give two coats to the following standard British single garage sizes. For larger spaces or double garages please work out the area in metres² and purchase enough to provide 2 coats. 2 x 10kg or 4 x 5kg packs would be enough for most double garages. If your floor has been subjected to oil we recommend first priming with RFC Oil Contamination Primer this will prevent the oil from attacking the paint from below resulting in flaking. For newly built garage floors we recommend waiting 4-6 weeks before applying our kits, this will allow any trapped moisture to escape and the concrete to fully cure. If this is not possible you could apply RFC Epoxy Damp Proof Membrane to your floor following which you can paint over instantly. To fill or repair damaged or pitted concrete surfaces use a repair mortar such as RFC Epoxy Fine Grade Mortar. This will result in a smoother, attractive and more professional finish particularly good if you plan to use as an extension of your home. RFC Garage Floor Paint is only microns thick so if you have a rough surface and the decorative aspect is important to you we would recommend smoothing and filling prior to application. Please note the colour swatches above should be used as a general guide only. For colour critical applications please request a sample prior to ordering or installing. Our most popular colour mid-grey is now stocked and therefore available for next working day delivery if ordered before 12 mid-day. All other colours are currently made to order and delivery will be 3-4 working days. Our resin floor paints are safe to use in the home but the law requires for safety data sheet information (SDS) to be available, please find this information below in PDF format. This purchase is for the paint only, you can also purchase with a complete garage floor installation kit.